I swear I just sat down and wrote my December self-portrait post like 3 days ago! Seriously, WHERE HAS JANUARY GONE? It's been an interesting month, to say the least. The first part of January was filled with a ton of frustrations while attempting to settle into our new house. It kind of felt like something was going wrong at every turn, and there was a point where I was ready to run screaming down the street and never look back. Let's just say that I'm trying to find the good in the fact that 90% of our faucets are leaking by focusing on the fact that we've decided to fix the problem by remodeling two of our bathrooms, and I'm looking on the positive side of a dying dishwater motor by focusing on the fact that I will very soon have one that I got to pick out. And as an added bonus, I am seeing the huge blessing in the fact that my over the top OCD required me to clean every inch of our house, and then some, upon moving in, meaning that the mold growing in our heating/cooling duct system was detected in the early stages instead of years from now after it had invaded the entire house and affect our health. But I bet you're wondering what any of that could possible have to do with the photo you see below. So, let's move on to the second half of my month. A few days ago, I photographed my very. first. wedding. Eeeek! I swore I would never photograph weddings because I didn't want the pressure of capturing someone's big day on my shoulders, yet I some how found myself agreeing to photograph a few special ones this year. So, I spent the past few weeks feverishly reading and watching everything I could possibly get my hands on to help me prepare for the big day. One of the things that the bride and groom requested was photographs using sparklers. 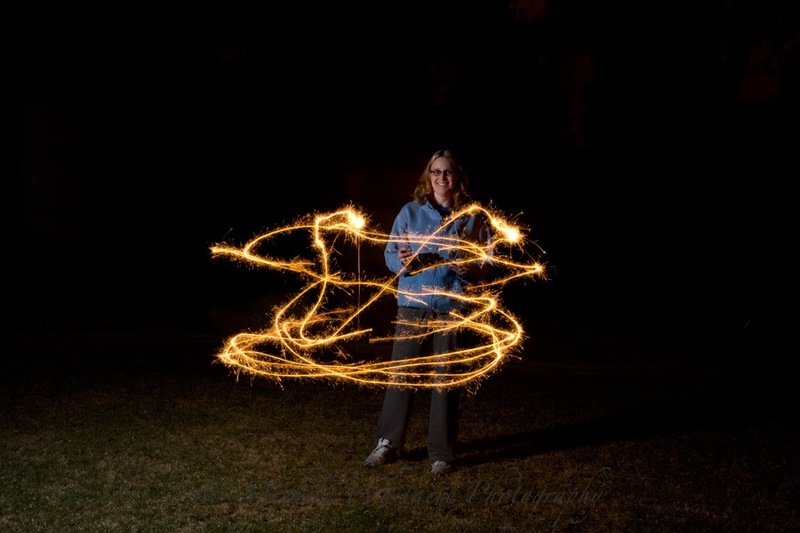 I did learn how to do sparkler photos during a workshop I attend last spring, but practicing them wasn't a priority and they were relegated to the bottom of my list of things to experiment with someday. You can bet they got bumped up to the number one spot as soon as the couple asked for them! And I'm just now realizing that I have on the exact. same. thing. as I had on in last month's portrait. I swear I do own more clothes than this outfit. Apparently this is my go to comfy outfit lately. So much so that I didn't even realize I had it on in both photos until just this very second. Too funny! Sorry about all the problems with your house. I've been having problems with a leaky faucet too. I really do need to have a plumber come in one of these days and take care of few things. They're just so expensive though, so I don't know when that will happen.